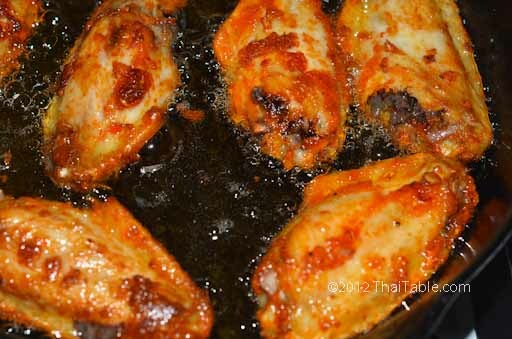 These wings have crispy skin that is full of Thai curry flavor. Yet, they are not spicy hot like some Thai dishes. 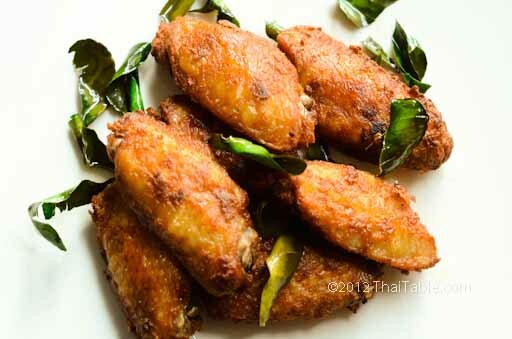 The crunchy kaffir lime leaves add texture and fragrant, making the wings distinctly Thai. Fried chicken wings is a perfect dish to do in a pinch. You can serve them as appetizer, with sticky rice or as a main course. Some store-bought red curry paste can be very hot. If you prefer your food mild, you may want to start with a smaller amount, about 1 teaspoon. In this recipe I use homemade curry paste that is full of spices but not hot. 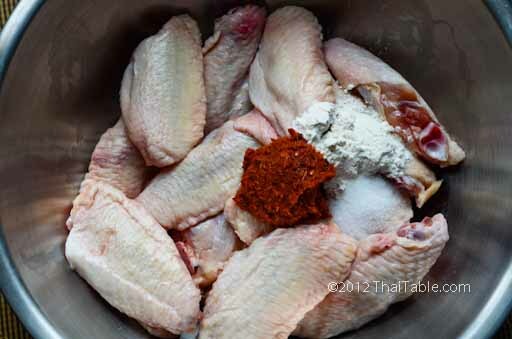 If you like your wings saltier, sprinkle more salt after the wings come out of the frying pan immediately. I use the mid joint wings, but you can use the drumettes or both. If you use both, separate the mid joint from the drumettes for even cooking. Taste your curry paste first. Often store-bought curry pastes can have quite a bit of salt. If so, skip the salt. 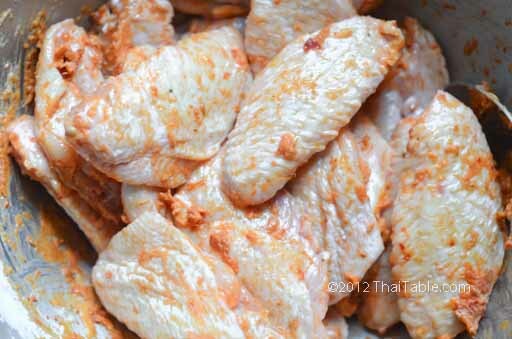 Mix the chicken wings with red curry paste, salt, flour and water. You need just enough flour so that the curry paste can cling to the skin. I add a little bit of water to dissolve the curry paste and flour. You can let the wings marinate overnight or a few minutes. Wash and shred the kaffir lime leaves into big pieces by tearing away from the center stem. Pat the kaffir lime leaves dry. In a frying pan, heat up enough oil. The oil should be enough to cover the bottom side of the chicken. When the oil starts to shimmer, add the kaffir limes. They should come out of the oil as soon as they get in. Strain the leaves out and set aside. Over medium to low medium heat, add the chicken wings to the hot oil. Let the wings fry until crispy. It should takes about 8-10 minutes. When the wings look cooked, turn up the heat to get the skin crispy. When the wings are done remove them from the oil and set them on a serving plate. 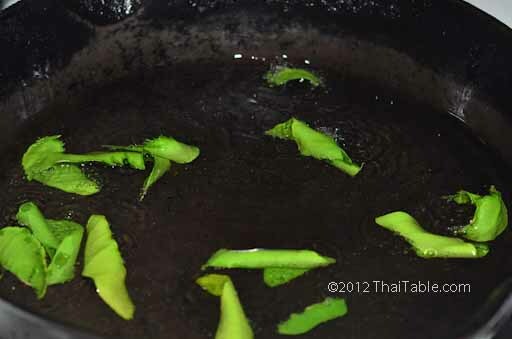 Sprinkle with the crispy kaffir lime leaves. Serve hot as appetizer or main course.